Such an interesting perspective of hexies taken at an angle. You can see it's a flimsy already. This is a quick quilt. A few of you have asked for more details, and I will gladly show them in the near future. Yes, there are a few Y seams, but no, they're not difficult. I may have a video to show you better than explaining it all. Wouldn't that be nice? 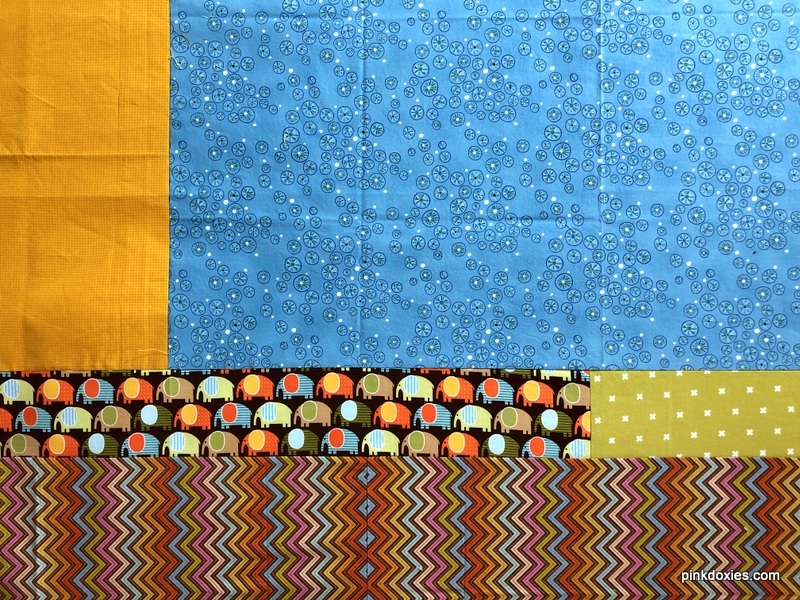 This was entirely machine pieced, and again, it is a quick quilt to make. Carefully and creatively, I used every last inch of my green background fabric from Cotton & Steel in this quilt. 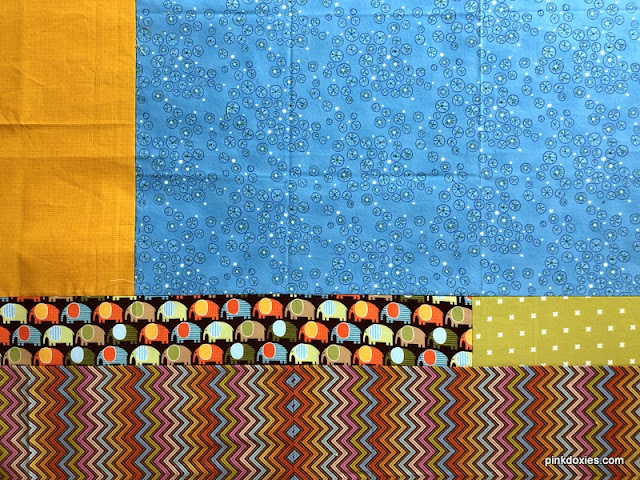 I've used this fabric in many quilts because colors just pop off of it. The last bit is stripped into the pieced backing with the zigzag and elephants. The blue wheels have a spot of green and white in them, and it all fits just perfectly, if not a bit wildly together. The flimsy, or top, and backing are side by side and ready, and the batting too. All this needs is a tag pinned to it with dimensions, thread choice, and my binding fabric, and I'll add it to the quilting line up. All these fabrics came from my stash. I love that, and I love this little quilt. By the way, it's very close to a 50" square give or take a few inches. What a perfect play quilt it will be! I love it!! I'd love to see a video so I can give this a try. Wow, I love it! This would make a fabulous Christmas tree skirt pattern, just left hexie-shaped. I love that! So so pretty! Very outstanding design. 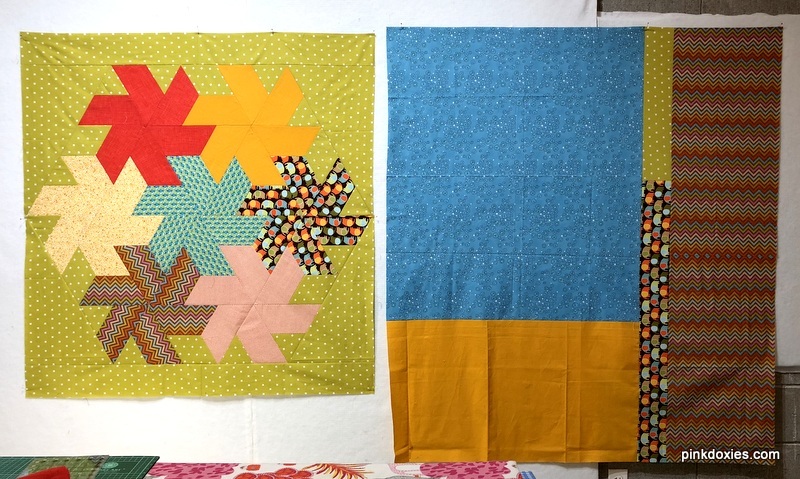 It combines modern plus reliance on historical quilts. Love the background fabric. I am always searching for a green like that. 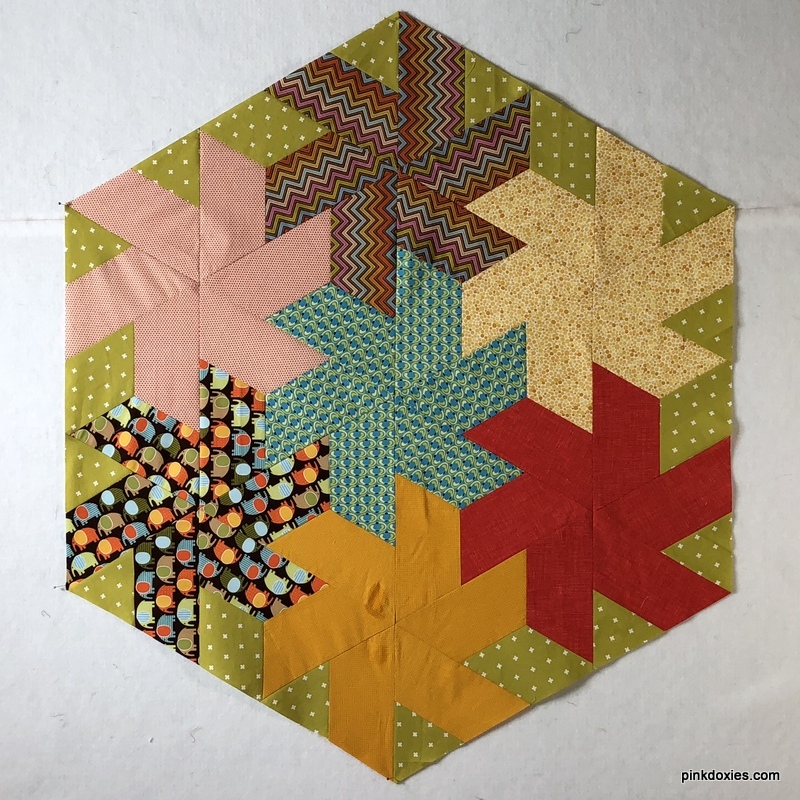 How big are the half hexie pieces? What size template did you use? That is TOO cute! i love that you didn't put the elephants in the center! Great quilt. 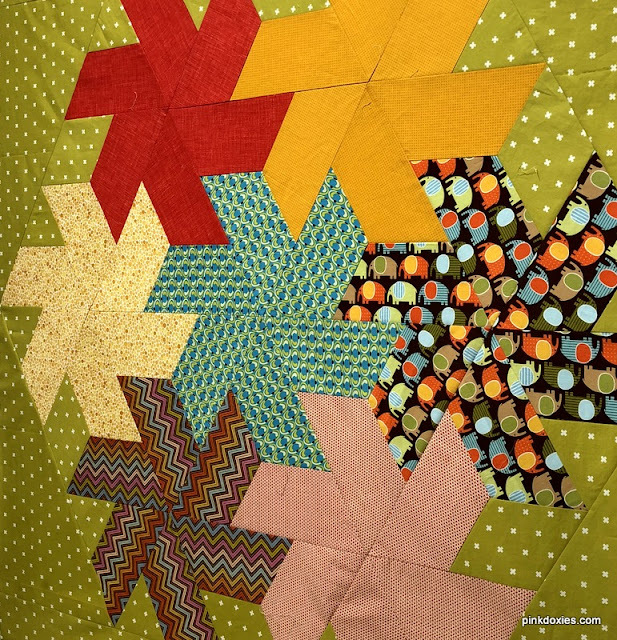 What a good use of the scraps from this quilt. Must do more backs that way. 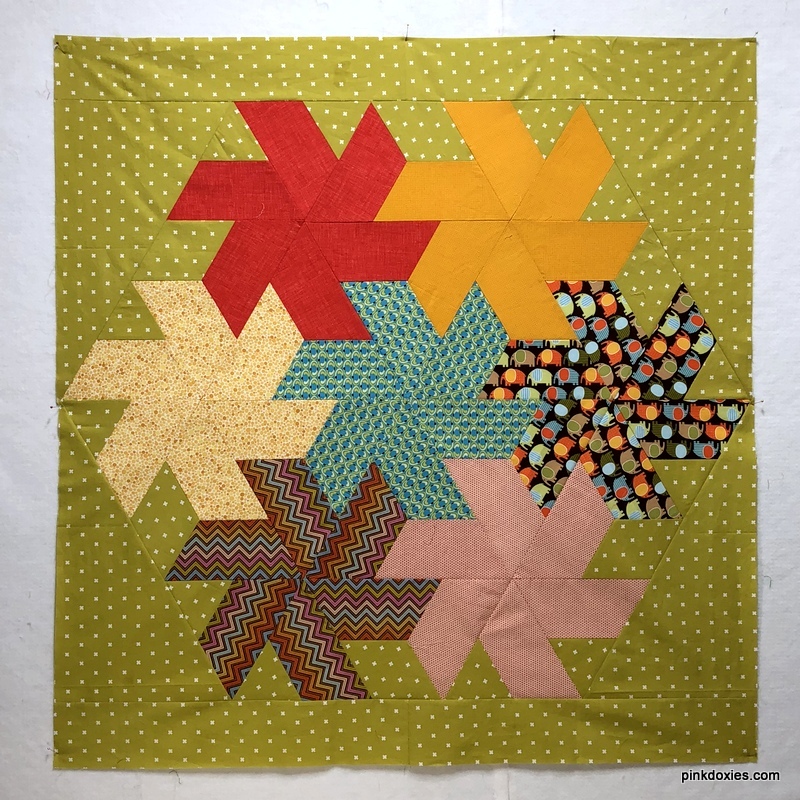 This quilt is darling, Julie! 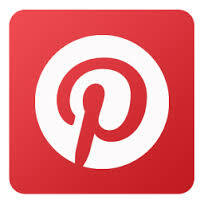 Pinning the pertinent info to the top before you set it aside is a great idea. When I come back to a project I have to waste so much time remeasuring, hunting around wondering whether I already bought backing fabric and binding or not. I need to keep better records like you do! It’s a lot bigger than it looks! I...don't....know....the stitching together looks pretty complicated to me! Wow! That came together fast! Congrats on finding a fun project to play with and actually finishing it too. The back is almost as fun as the front. I love that little strip of elephants.